This is the story about a seagull that not only talks but has some exceedingly unusual adventures. If you are the type of person who gets a special pleasure out of doing something well; If you think there’s more to this whole living thing than meets the eye, then we dedicate this story to you and the real Jonathan Livingston Seagull who lives within us all. Jonathan Livingston Seagull would fly all day and night Jonathan Livingston Seagull flying to an unknown height Jonathan Livingston Seagull flying for the joy of flight. 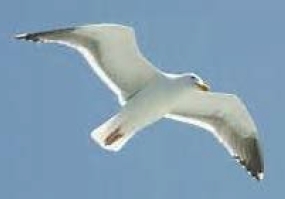 Body shaking, wings near breaking, diving, turning, ever learning, Jonathan Livingston Seagull, was no ordinary bird. Jonathan Livingston Seagull did the things gulls never knew Jonathan Livingston Seagull learning what he could really do Jonathan Livingston Seagull dove from high up in the blue A thousand feet above the sea, reaching the speed of seventy three Jonathan Livingston Seagull knowledge daily grew. Jonathan Livingston Seagull knew there was no guarantee Jonathan Livingston Seagull his wings held still the key Jonathan Livingston Seagull if he makes it he’ll be free Swiftly downward from the sky, if he crashed he’d probably die Jonathan Livingston Seagull smashed into a brick hard sea. Jonathan Livingston Seagull, tried to be what he couldn’t be Jonathan Livingston Seagull, smashed into the sea. Remember a gull is confined, his purpose in life is very well defined Seagulls would have charts in their wings Short wing like a hawk would be their design. Though the night is peaceful and still Seagulls flying fast is not one of their skills Gulls wings are wrong, because they’re too long. Short wings of a hawk are needed to be-long To the birds flying fast, the gulls wings are too long Jon’s wings are too long, a hawk’s short wings are strong. A hawk’s short wings are strong. Short wings; short wings. “That’s the answer,” Jonathan thought. Short Wings. Flying up to 2000 feet, he went into a vertical dive and reached 140 mph. Up to 5000 feet, he dove again and was going 214 mph but discovered he couldn’t stop at that speed. He flew directly into the breakfast flock and then up again. Luckily no one was hurt. He continued flying until dark and then landed. Now a gull has a reason for living. Jonathan, now alone, flew out beyond the far cliffs and lived his life, learning and flying alone. Through old worlds to new ones, his path untraveled sky Through eternal space he had never to ask why. Into emptiness and silence, to endless spans of light Into countless far horizons and shadows seen by night. Countless years of flying, in the unknown folds of space. His only friends the clouds, and the soft winds to embrace. Out of darkness into sunlight, he sailed the unknown spheres In the futures of tomorrow, through the long and lonely years. Think of instant time, Jonathan, think of instant space, Jonathan Think and understand, Jonathan, think and understand Before the years and time’s gift of tears, came shadows of starlight And soft winds for flight, Jonathan. Speed has no limits, Jonathan, speed is fast as thought, Jonathan Speed is everywhere, Jonathan, speed is everywhere. Perfect in speed is perfect in thought, you can be any place And be anytime, Jonathan. Other gulls soon came and they now numbered seven. After giving them a number of lessons Jon said, “We’re free to go where we wish.” With that he headed back toward his old flock. Charles Roland Gull loved flying high. He’d fly so high he’d nearly die. Twenty thousand feet above the sea, cold but happy to be free. Fletcher Gull was very, very good. He’d do anything he said he could Acrobatics was his special bag, loops and spins and quick zigzags. Terrence Lowell was the first to say, “I’d like to learn to fly today. I will be an outcast till I die, but it’s worth it to learn to fly. Kirk Maynard’s body was very, very bad. His wing was bent and his mind was sad. Please help me fly he softly said. My wings won’t move, oh I wish I was dead. You can fly Maynard cause you’re free. It is the law, it will always be. Nothing Maynard can stand in your way. You can fly both night and day. Other gulls soon came and they now numbered seven. After giving them a number of lessons Jon said: “We’re free to go where we wish.” Then Jon headed back toward his old flock.